I talked with the owner of the MOM Mustang Owner's Museum at the show yesterday. They want my 1973 Mach 1 to go on display there. I have posted ads on Craigslist for help to get it cleaned up by April 2019. I have to have spine surgery so I cannot lift much at all. Have until April 2019 to get it ready. Will take the entire car apart and put back together after detail cleaning. Will not be a restore. They did research and looks like it is the highest optioned Mustang from 1064 1/2 to 1973. Will do video and pictures of the cleaning and post here and on youtube. My car has 32 factory installed options and 8 dealer options 12,200 miles and in barn since 1982. They can only display 60 vehicles at a time so would be super to be there for Grand Opening. Since my family is not interested in cars might donate to preserve it. Some idiot at my estate sale would restomod it. Pic is how it looked going to barn. I put ozone generator in car today and electronic mouse repel-er in also, lol. Will take video and pics of whole process so others see an original car. Congrats on the selection. Maybe enlist the local Mustang Club to help with cleaning an detailing. You have mentioned this car many times and it is awesome that you have held onto it all these years. If I may ask, why did you park it in the barn in 1982, presumably to never be driven again? It's a shame there was not a more secure and dry storage option available all these years. I'd imagine the car has deteriorated quite a bit in a barn located in NC. If it just requires disassembly and general cleaning/restoring then perhaps it's not too bad. I wish I would still have a few of the cars from my youth, but in PA they would have rusted into the ground by now without proper storage. David, yes, congrats on the selection from me too. That's awesome. I must admit, since I joined the 7173Mustangs.com forum, I have often read your posts mentioning your " owned from new 73 Mach 1" and wondered why you have restored several other mustangs or at least worked on them and not restored your own "baby". I guess you must have a valid reason, but it begs the question, Why Not? Please post some pics of it when it's done and ready. You have many followers on this for sure. Congratulations David. I look forward to seeing the car at the MOM grand opening in April. I wish I lived closer to you, I would be happy to help you with cleaning up your Mach. LOL, I have been asked hundreds of times WHY do you let it sit there? First off I placed an ad on Craigslist for some energetic young man wanting to learn about mustangs and have two replies in one day for free help. Now on why it sits there. I was a member of MCA way back in the 1970's if I remember right. I got married in 1978. She had wrecked every vehicle that she had ever driven. Right after the wedding I parked the car. Well in 1981 or 82 I decided to take it to Atlanta to the MCA Nationals. So me an my nephew just cleaned it, still had rice in the carpet from the wedding, polished the wheels, put on NOS Goodyear RWL and took to Atlanta. I took on a trailer pulled with my 1969 Ford van with a 240 six cylinder. I did not clean the underside at all just interior, under the hood and outside. I never was one to wash a car just wipe it off to keep the water out. Well I got a third place in original un restored. The right front fender had been scratched on a mail box by a friend and he had it painted in lacquer and did not match. Those that have been in MCA shows know that you receive your judging sheets later in the mail or you did back then. When I got the judging sheets the points I had lost were due to NON FORD or NOT correct items on the car. Everything on the car was from the Ford factory. So I had a little discussion with the man most of you know as Bob Perkins. He was the head judge back then. He told me to do any better I would have to change everything that was noted on the judging sheets. I told him he could kiss old rusty and took the car home, dropped my membership and never went back. Family and job then took all my time so it just sat there. I bought other cars that also just sat there, lol. There is a 1956 Ford Club Sedan one owner 292 4-V overdrive in the barn, 1957 Fairlane 500 two door hardtop 312 4-V, a 1950 Ford two door one owner and I moved the other 1950 Ford two door with 16,000 miles to the new garage. BTW the 1950 with 16,000 miles sat in a barn in Buffalo New York from 1954 to 1996. Was on blocks to get tires off dirt. When I got it in 96 it started and ran fine. I pulled the brakes apart and no rust in master or wheel cylinders. Looking inside the engine with scope it looked brand new. I drove to several shows with the original tires, belts and hoses that it still has. Long term storage is not all that bad as long as nothing can get into the carburetor or through an exhaust valve from the exhaust. I will look into each cylinder with a scope before moving the crank. I will pull the hood, front fenders and take the engine out to detail engine bay. Will also pull dash and take air conditioner out I never had the wire mesh in this car so I am sure lots of acorns and mice nests. The interior will be removed cleaned and put back. Hope to find the build sheet never had interior out. So my biggest obstacle is having the spine surgery in coming weeks. I do hope the two guys are serious about wanting to learn. One says he put his Dad's 66 Mustang back together for him. I have already put some feelers out about getting some help with the Goodyear tires in trade for ads in the booth with car. I think he told me only room for 60 cars but will see. 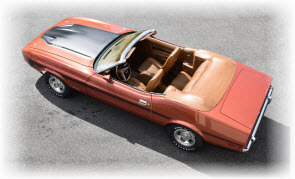 The 73 convertible I got that sat for 27 years, 25 in Reno and two here had no issues with engine at all. I drove to the show in the mountains on Saturday. It was bored .050" over and has flat top pistons with a cam and does not overheat. The cylinders looked new when I pulled the heads to correct the backwards head gasket. When I look back I wonder where all the years went so quick. My job for years put me on a plane on Monday and back home on Friday. Spent 17 months in China and nearly a year in Africa. As far as the guys in the local Mustang club they pay someone to work on theirs. There is one other member that does his work and his body is worn out also. So will see how it goes I do have all the tools and equipment to make all of the work as easy as it can be. 2 post lift, A frame, engine lift, clean room, etc. etc..
Plan on lots of pics and video to document the process. I may donate the car to the museum. Once I am gone would be sold at an estate sale and probable turned into a restomod. Yes I figured that was the reason- "life got in the way". lol There are a lot of these cars around, more than people would think. Around five years ago I came across a '68 Pontiac GTO, 400 4 speed, 37000 miles, original owner, in Pittsburgh PA. He bought the car new and pretty much the only change was to aluminum slot wheels and wide tires on the rear. I believe rear air shocks were added in order to get clearance for the rear tires. Every hot car was like that when I was a teenager. Water pump was replaced under the original warranty and the car still has the original brakes and many other items. He parked it in the garage in '78 when he got married and that's pretty much where it has remained. He starts it and moves it in the driveway a few times per year and the inspection sticker is still from '78. He was asking $50K firm, which was a bit too much at the time IMO, and it's probably still sitting in his garage. I had posted an ad in Craigslist for someone to help on getting the Mach 1 ready for the MOM. I got two guys that were interested but one was too far away and the other was a student so not too much time. I got another call yesterday and he is coming over today to talk. I also have someone lined up to do video and editing of the video. She works with the local playhouse and also does some video on the side. Since I go to Africa quite a bit I have a pretty good Sony HDR-FX1 video set up that will be used. Will make lots of pics and video from the day we start until it goes into the museum. So I hope this guys works out he has MS and trying to fight that off but was a Ford mechanic for many years and just loves cars. I have offered him use of the garage on his project also so will see how it goes. Just lots of cleaning and detailing will not use pressure washer unless maybe on the underside. David, thanks for taking the time to explain your reasons for "Why Not". As you said, you got married and life just gets in the way. That's how it should be. Cars are just toys. Family and kids are really what life is about. I'll certainly look forward to following the progress on 'ol 73. It'll be interesting for sure and I hope it turns out the way you want it to. All the best with your upcoming surgery and a speedy recovery.